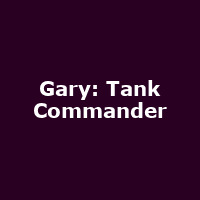 "Gary: Tank Commander" is a BAFTA award-winning Scottish sitcom, written and created by Greg McHugh. "A new show that's likely to channel the United Nations meets Eurovision - an all fighting, all singing, (mibbe) all dancing (mibbe) extravaganza. Having previously sought a replacement cooker for Gary's dad, lost a tank in the line of duty and fought a personal battle with a vending machine for a Curly Wurly - Gary Tank Commander: Live - Mission Quite Possible will take things to another level!"